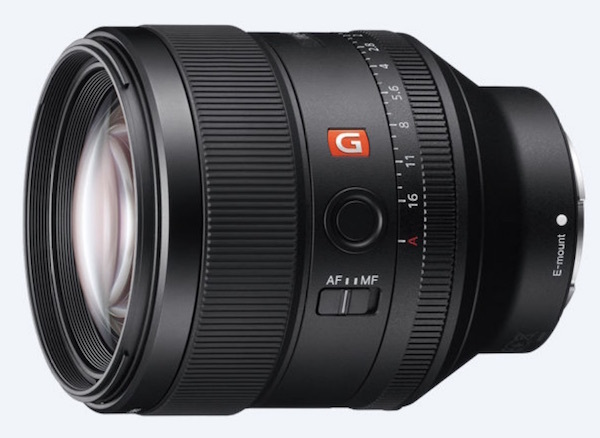 We are pretty excited about the new Sony G Master Lenses for FE mount cameras. Our excitement may be a little different than yours because we see the Sony FE lenses as an evolving new product. There were some things we really liked and some things we really didn’t like about the first FE mount efforts, but we’ve been seeing signs of progress. We were hopeful that the new Master lenses were going to take another step up in optical quality. The first one we took to the lab for testing was the FE 85mm f/1.4 G Master lens. Early reports from photographers indicate that Sony has done well with this one. We don’t always review lenses, but we do test them for MTF and variation, and for us, reducing copy-to-copy variation was one of the things we really hoped this lens would do. I discussed in our post about the 70-200mm f/4 lenses that our testing algorithms and presentations are changing as we improve things and try to make them more scientific. If you missed that there are two major points. First, the variation algorithms have changed, both to make the charts easier to see (we show a 1 Standard Deviation range, rather than the 1.5 S. D. we used to) and to eliminate the Consistency Number. We found that the Consistency Number was too blunt of a tool; it showed only one limited part of variation. There were cases when there were two lenses had the same consistency score, but one was quite a bit worse than the other in ways the score didn’t show. 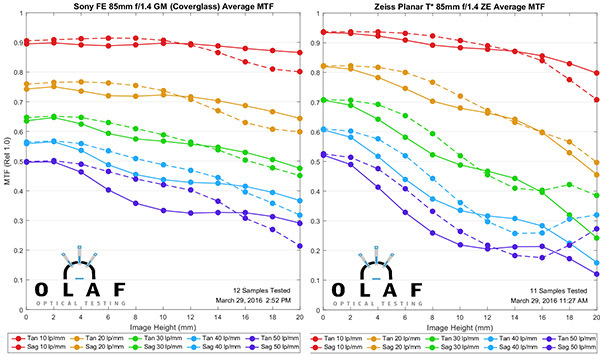 Second, I want to continue to point out that the MTF bench is not designed to test lenses that require power to maintain focus position, which FE lenses do. We’ve worked around that by making an electrically live mount, but the electronics block some of the test points at 20mm from the center (the right side of the graph). For that reason, the measurements at the edge have fewer measured points than the other points tested. Take them with a mild grain of salt. 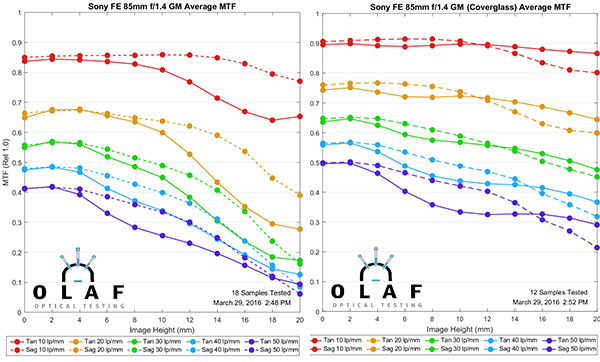 I’ve compared the MTF results for the Sony FE G Master with four other well-known 85mm f/1.4 lenses: The Zeiss ZE 85 f/1.4, Nikon 85mm f/1.4 AF-S, and Zeiss Otus 85mm f/1.4. It should be pretty apparent that the Sony lens belongs in this company, at least as far as MTF goes. The ZE is a bit sharper in the center but the Sony is better toward the edges. The Sony and Nikon are actually quite similar. The Otus, of course, smokes all the others in the central part of the image, but at that price I would expect it to. You can split hairs all you want about which is better at what, but these are all really good lenses. The tiny differences between them would certainly be lost in the other variations of cameras, lighting, and technique. And yes, I know you all wish I had the Zeiss Milvus 85mm f/1.4 MTF charts to compare it to. I wish I could ever get 10 of the in stock at one time so I could test them. So far no joy, I’m afraid. We ran our new algorithms on the same lenses we tested above to give you some frame-of-reference for comparison. Let me get one thing out of the way really early. 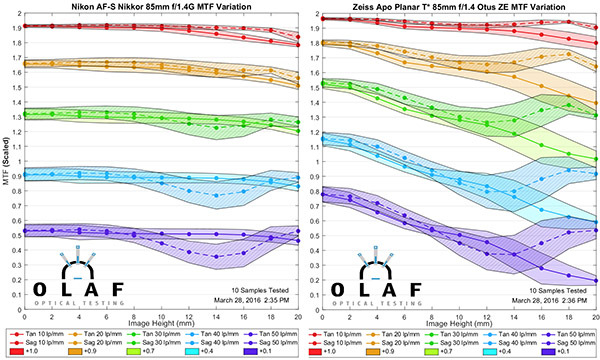 Those of you who compare will find the graphs for the other three lenses are just a bit different than the original variance graphs we’ve used, because, as I said, the algorithms are different and a bit more sensitive. But in our previous system, the Zeiss ZE Planar lens was acceptable and the Nikon and Zeiss Otus lenses very good as far as the copy-to-copy variation. The Sony FE 85mm f/1.4 G Master lens compares very well with these other top lenses. There’s none of the severe copy-to-copy variation we saw with the Sony FE 35mm f/1.4 lens. 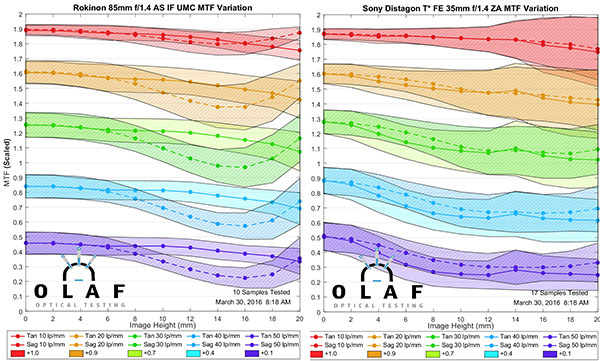 Just to give you more of a comparison, below are the variation graphs for the Sony FE 35mm f/1.4 and Rokinon 85mm f/1.4 lenses, both of which have significant copy-to-copy variation. When you compare the G-Master to these lenses, there’s no question Sony has done a really good job improving variation on this new lens. Because I know some fanboys are going to ask, yes we’ve retested Sony 35mm f/1.4 lenses recently, and no the copy variation hasn’t changed. If you thought it might you need to read this to understand why it’s unlikely to happen. I know you really, really want it to be so. Really, really wanting something to be so, unfortunately, doesn’t work all that often. Of course, the proof of a lens is in the pictures it takes, not in this simple testing. But the test results can be useful and these are certainly reassuring. The Sony FE 85mm f/1.4 G Master lens is pricey, but not much different than the price of other top-quality 85mm f/1.4 lenses. It delivers the image quality you would expect for the price and copy-to-copy variation is reassuringly low. Sony has definitely taken strides to fix the variation problem that we saw in some of the earlier FE lenses. Give them credit, and also give them some understanding. They are turning out lots of new lenses in a new mount with a bunch of new technology. There are always going to be some growing pains when a company does that. Addendum: The difference between glass and no glass. I talk a lot about how some lenses require a certain amount of glass between the back of the lens and the image sensor. All digital cameras have some. Certain lenses are rather insensitive to this and don’t care if there is glass present or not. Others are tuned for a specific amount of glass between lens and sensor. Wide-aperture, wide-angle lenses are most likely to be sensitive, but some longer focal length lenses can be, too, as was the case here. 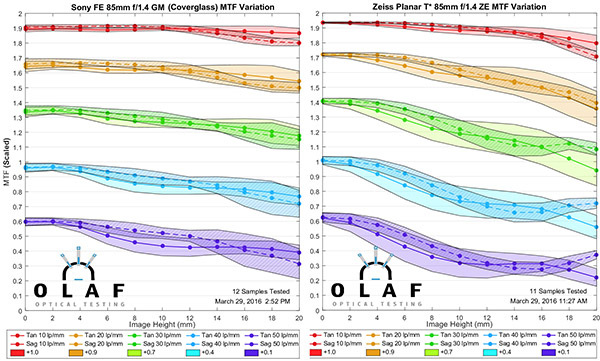 I’m just putting the MTF charts with and without optical glass in the path to show you how much of a difference that made with this lens. If we had presented the results without glass the Sony lens wouldn’t have looked very good at all. Thanks Roger. Great stuff. 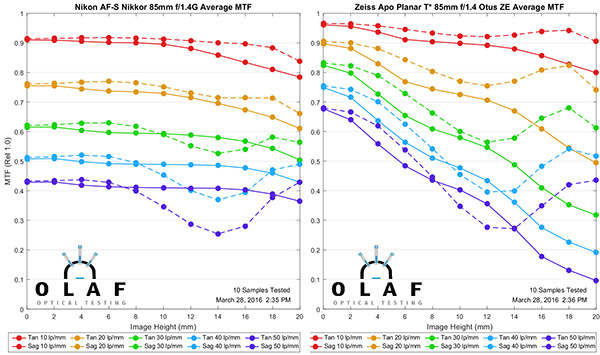 I would love to see test results at an aperture other than wide open on any one of your tests for any lens comparison. Just a wish. How would one interpret the results of your tests to the real world; outside of higher frequencies corresponding to better results with sensors of higher pixel densities? Hi, you wrote “Most 85mm lenses we’ve tested do not improve with glass.” Does this mean that the most 85mm lenses you tested did not perform worse with the 2mm additional glass? I appreciate your comment/clarification. If so, I suspect that (1) the performance of short flange back (e.g. E-mount, M-mount, CONTAX G-mount) lenses tends to be highly impacted by sensor coverglass; and (2) the performance of typical SLR lenses do not change much when the lenses are attached to Sony E-mount cameras using an adapter. These MTFs are all wide open. Spaceman, the graphs are made with the lens wide open and focus at infinity unless otherwise specified.